A Cross-Functional Process Map is a picture of the sequenced steps across functions that depict how inputs are converted to outputs. It shows the flow of inputs/outputs across a process and the functions in an organization. 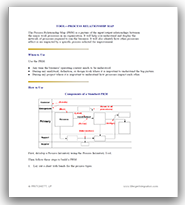 The three-page document describes when and how to build a cross-functional process map. 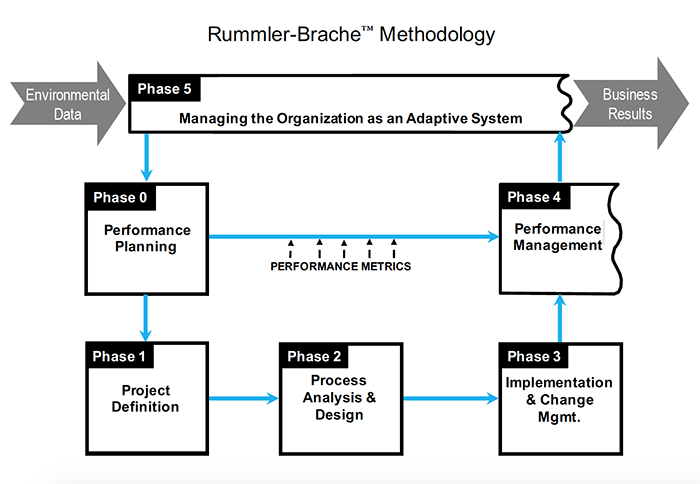 Rummler-Brache’s Process Performance Index is a broad-gauged scan—a quick “organization physical”—that systematically appraises your process situation and identifies opportunities to achieve improved results. 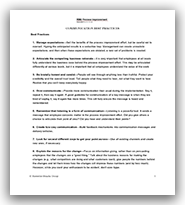 The two-page document describes when and how to use the "COULD BE” Prioritization Worksheet. 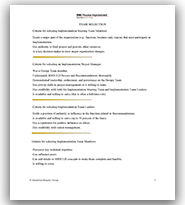 The Worksheet guides the Steering Team in prioritizing the “COULD BE” Designs against Project Goals and other criteria. 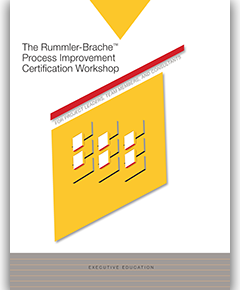 The two-page document describes the eight steps involved in designing a new, improved cross-functional process. 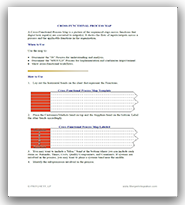 The Measures Chain Worksheet is a tool for linking process and sub-process outputs and creating a measurement system that will meet an organization’s troubleshooting criteria. 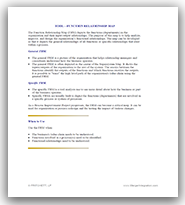 The two-page document explains how to create a measures chain and provides an example. 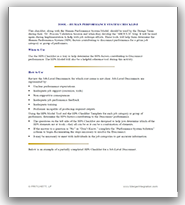 This checklist, along with the Human Performance System Model, should be used by the Design Team to help determine the Human Performance System (HPS) factors contributing to suboptimal performance for a given job category or group of performers. 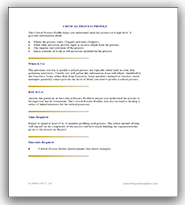 The two-page document describes when and how to use the checklist and provides an example. 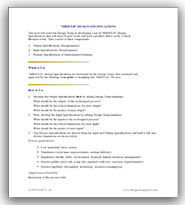 Criteria for choosing steering team members, implementation project leaders, team leaders, and team members. 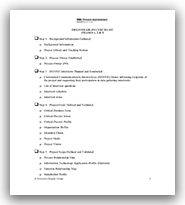 Checklist of more than one hundred deliverables to ensure no key activity is overlooked. Includes activities for Phase 1: Project Definition, Phase 2: “IS” Analysis and “SHOULD” Design, and Phase 3: Managing Implementation and Change. 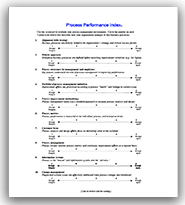 The Critical Process Profile provides information about where the process starts (Trigger) and ends (Outputs), and what other processes provide input or receive output from the process. 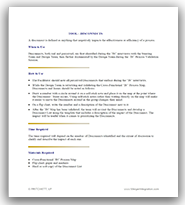 The three-page document describes why the tool is useful, and when and how to use it. The Function Relationship Map (FRM) depicts the functions (departments) in the organization and their input/output relationships. The purpose of this map is to help analyze, improve, and design the organization’s functional relationships. 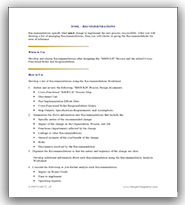 The six-page document describes when and how to build a General and Specific Function Relationship Map and provides examples of each. 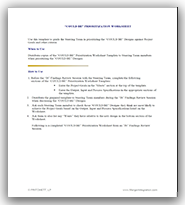 Recommendations specify what must change to implement the new process successfully. 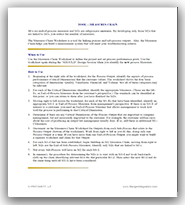 The four-page document describes when and how to develop Recommendations, what’s required, and provides examples. A disconnect is defined as anything that negatively impacts the effectiveness or efficiency of a process. The two-page document describes when and how to identify disconnects and provides an example of a disconnect list.